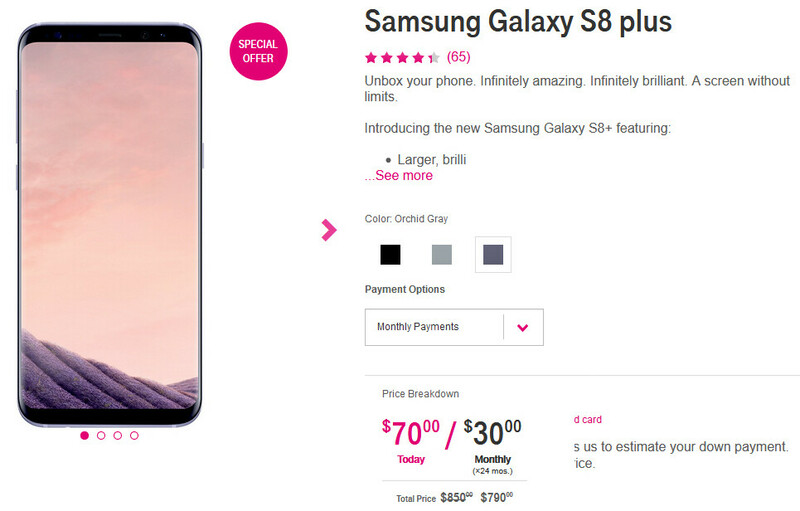 In addition to offering two Samsung Galaxy S8 phones for the price of one (in certain conditions), T-Mobile currently has another deal, specifically for customers who want to buy just one Galaxy S8+. More exactly, the magenta carrier is taking $60 off the price of the S8+, selling it for $790 instead of $850 - this way, the Galaxy S8+ is only $40 more expensive than the regular S8 (which costs $750). You can choose to pay for T-Mobile's Samsung Galaxy S8+ outright, or monthly ($70 upfront, plus $30 per month for 24 months). The handset is available in three color variants - black, silver, and orchid grey - though the last two are currently backordered, and may not be ready to ship before early August. T-Mobile says that this is a limited time offer, but doesn't mention when it will end. To take advantage of the deal, you can visit T-Mobile's website (via the source link below), or one of the carrier's stores across the US. Lol Samsung worries you all hours of the day... Where's the rest of the Pocket B!tches at so you can cosign and up vote each other?